The Economic and Financial Crimes Commission, EFCC, has arraigned Alhaji Yerima Suleiman and Mr. Uwem Essien Antia before Justice Lawal Akapo of a Lagos State High Court sitting in Ikeja on a four-count charge bordering on conspiracy, obtaining money by false pretence and forgery. 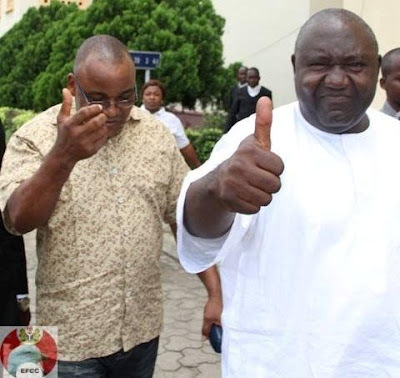 Yerima and Antia ran into troubles, when they were arrested in March, 2015 by operatives of the EFCC for allegedly stealing the sum of $2,250,000 (Two Million, Two Hundred and Fifty Thousand United States Dollars) from two bankers: Aginwa Gladys and Ale Dennis. The suspects allegedly approached Aginwa and Dennis in February, 2015, offering to sell foreign exchange to the tune of $10,000,000 USD to them. After agreeing on the exchange rate, a sum of N672, 750, 000 (Six Hundred and Seventy Two Million, Seven Hundred and Fifty Thousand Naira only) was transferred from BlueBeam Capital Investment Limited and Capital Field Investment and Trust Limited into the account of one of the bankers: Smiles and Light Limited. It was from the banker's account that the entire sum was moved into Antia’s account: Kafisto Oil and Gas Limited. Findings showed that the entire sum of N672, 750,000 actually hit Antia's account. A Bureau de Change operator who changed the money into its dollar equivalent, told EFCC's investigators that he went with Antia to his bank, along Bourdillon Road, Ikoyi, Lagos, where the transaction was confirmed. The Bureau de Change operator further revealed that, Antia subsequently transferred the sum of N666, 250,000(Six Hundred and Sixty- Six Million, Two Hundred and Fifty Thousand Naira only) into his own account. He said he worked out the dollar equivalent of the money, which was $3,127,000 (Three Million, One Hundred and Twenty- Seven Thousand United States Dollar). He said he could only give $3,124,000(Three Million, One Hundred and Twenty-Four Thousand Dollar) to Antia, leaving a balance of $3,000(Three Thousand Dollar), which he promised to give him the next day. Immediately Antia collected the foreign exchange, he reportedly headed for Number 17A, Awolowo Road, Ikoyi, Lagos, where the two bankers and his accomplice, Suleiman were waiting for him. However, rather than handing over the entire foreign exchange to the bankers, he only gave them $1,000,000(One Million Dollars), claiming that he could not source the entire amount. He allegedly promised to give them a balance of $2,250,000 (Two Million, Two Hundred and Twenty- Five Thousand Dollar) the next day. This balance would be the dollar equivalent of the entire sum of the transaction (N672, 750,000). The bankers said that, since the day Antia and Suleman gave them the initial $1,000,000, all efforts to reach them had proved abortive. "Their cell phones were turned off", they said. However, they lodged a complaint with the EFCC and operatives of the Commission eventually arrested the two fraudsters. The fraudsters, upon their arrest, claimed that they had given one of the bankers, Dennis the balance of the money at the Murtala Mohammed International Airport, Lagos, but investigations by the Commission, showed that no such transaction took place. Count one of the charge read: "Alhaji Yerima Suleiman and Mr. Uwen Essien Antia on or about the 5th day of February, 2015 at Lagos within the jurisdiction of this Honourable Court with intent to defraud, conspired to obtain money by false pretence from Dennis Ale and Aginwa Gladys. Another count read:"Alhaji Yerima Suleiman and Mr. Uwen Essien Anita on or about the 6th day of February, 2015 at Lagos within the jurisdiction of this Honourable court, with intent to defraud and in order to facilitate your obtaining money by false pretence from Dennis Ale and Aginwa Gladys, forged acknowledgement of receipt dated 6th February, 2015 purported to have been made by Dennis Ale." When the charges were read to them, they pleaded not guilty. In view of their pleas, prosecution counsel, Gbolahan Latona prayed for a trial date and the remand of the accused person in prison custody. He told the court that the 1st accused person was also a defendant in another fraud charge before another court.